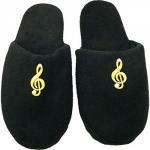 This Music House Page presents Gifts of Music to Enjoy Wearing! Music is one of those lifelong details that molds you into the person you become. 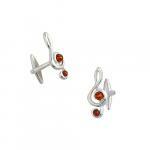 The music you enjoy can determine your personal style, experiences and outlooks. At TheMusicHouse.Com, we understand everyone’s love of music. That's why we offer a wide selection of unique, bold and inspiring music-themed apparel and accessories that you’ll enjoy wearing and showing off. Whatever type of music or musician you love, at TheMusicHouse.Com, we want you to feel comfortable expressing yourself and let our musically themed apparel make a loud statement for you — the way your instrument or stereo would. We have a wide selection of music-themed apparel for any instrument you can think of, including keyboards, clarinets, saxophones, trumpets and guitars. 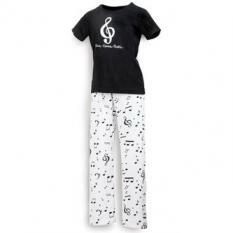 For those who enjoy being punny, check out our music-themed shirts declaring cooking feats like “Treble in the Kitchen,” and “Too Hot to Handel,” or give a light-hearted warning to friends with a T-shirt saying, “Here Comes Treble.” If you’re more understated, discover our stunning and eye-catching black and white silk sheet music-designed shirts or our music-themed hats. To complete a jazzy ensemble, browse through our large selection of bows and neckties. We have a variety of music instrument ties — enough to complete an entire band, including keyboards, clarinets, saxophones, trumpets, and acoustic, V-shaped and electric guitars. You can also test your friends’ musical knowledge by selecting a 45 rpm adapter-pattern tie or bow tie. Baseball Caps: Get inspired to play some sweet music with a high-quality baseball cap featuring embroidered designs of bass and treble clefs and some of our favorite woodwinds, like flutes and clarinets. Tie Tacks: For a retro statement, keep your tie in place with a beautiful gold tie tack available in piano, G clef and saxophone designs. Umbrellas: When you want to sing in the rain, trust our musical-themed umbrella to keep you dry. Pet Collars and Leashes: If your pet loves music as much as you do, let them stand out with a matching keyboard collar and leash. Vests: Our unisex vests are classically inspired and designed to perfectly complement any composer’s outfit — choose from simply elegant sheet music designs or bold patterns like our Mozart-themed vest. Our music apparel is perfect to flaunt out and about or serves as a wonderful and personalized gift for the die-hard music lover in your life. You can give one of our musical instrument baseball caps, ties or themed clothing as a thoughtful birthday gift, thank you present or just a spontaneous gift to a friend. 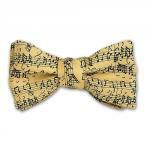 The list of musical designs available at TheMusicHouse.Com is almost endless and may include a piano keyboard or musical notes and design sayings or even your instrument — check out our musical apparel including G clef and musical instrument baseball caps for musicians, shirts embroidered with musical instruments, silk blouses and scarves with lovely music patterns, subtle musical patterned neckties and bowties, musical instrument shaped ties, socks, gloves, mufflers and scarves with musical designs and pajamas and slippers with a musical motif. 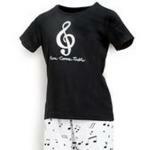 At TheMusicHouse.Com, we guarantee you’ll find the music-themed clothing that’s in tune with your style and interests. To learn more about our apparel options, call us today at 888-884-2533 to speak to a team member.